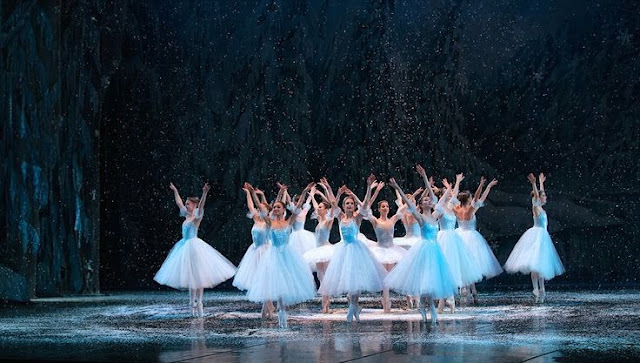 Last night, my daughter Jessie and I attended "The Nutcracker" ballet performed by the Colorado Ballet! The Ellie Caulkins Opera House was lovely with snowflakes lighting the walls! While we both love ballet, the real treat was seeing Jessie's young friend Elizabeth perform in it! The performance was beautiful. I loved the Snow Scene. 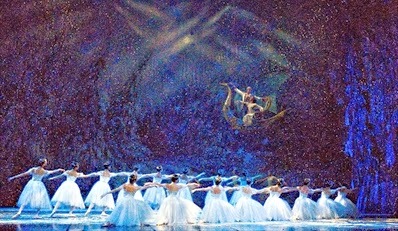 This photo is off the Colorado Ballet Pinterest site and is by Mike Watson. The set was magical! I wish I could find a photo of the side curtains. They were lovely ~ like embroidered netting filled with snowflakes! With the falling snow, it really was a special scene! This photo was found on the internet. Sadly, I don't know who to attribute it to. Jessie and Elizabeth got to know one another through their church and discovered that they share a birthday. Ever since then, they've had a special bond! It was a special treat to watch Elizabeth perform! Here they are after the performance!